Brother combinations in sports can be magical. A few hockey notables were Bill and Bun Cook, Daniel and Henrik Sedin, Peter, Anton and Marian Stastny, Bobby and Dennis Hull, Phil and Tony Esposito, Henri and Maurice Richard; they all played together at some point in their careers. 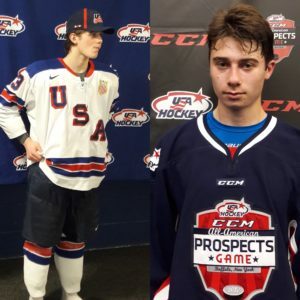 The World Junior Championship Summer Showcase is a great way to highlight what will be a long reign for Jack and Quinn Hughes playing for USA Hockey. Since they play different positions the question of which one is better seems silly. They both will be impact players in the NHL someday and they both do it in different ways. Quinn (lower right), the older brother, has a way of dissecting the play just before it happens. He can sniff out scoring chances and he can get players to chase him. His skating is so good that he can get around multiple players in the offensive zone. He’s a puck possession guy and he’s a guy that can bring it up the ice by himself. When both of them are on the ice together Quinn seems to be able to find Jack at the last possible second. He doesn’t have to be open for long. When he is, his older brother finds him, or Josh Norris as we saw in this latest tournament. Jack finds open spaces with his skating. It’s well above average and both brothers really know how to use their edges. Jack does everything at top speed. His speed through the neutral zone is the best I’ve seen since Nathan MacKinnon at that age. When he passes he sees spaces for players to get the puck on their sticks and he makes it happen. As a complete center, he’s working on being strong in the face-off dot too. “For me, that’s one of the things that I’ve been focusing on a ton. As a center, you have to be really good at face-offs. I’ve been working on that a lot,” said the younger Hughes. Jack sees himself as a playmaker first. “I’m a pass-first guy,” he added. Jack should break all the NTDP records this season if he stays healthy. He’ll be the first overall pick in the 2019 NHL Draft. As far as playing with Quinn (Vancouver drafted him 7th overall in 2018) at the World Junior Championships, I pity the opposing teams, these two will drive them batty.